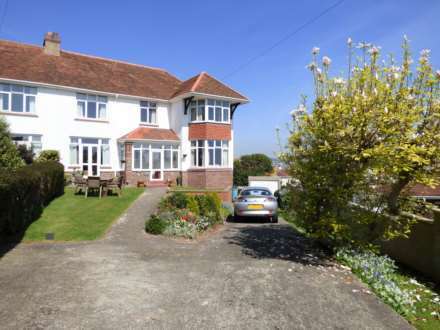 This mature 3 bedroom terrace house occupies a residential position within approximately one and a quarter miles from Torquay town centre with its array of shops, facilities and amenities. It is also within close proximity to Warberry Church Of England Primary School. An internal inspection is highly recommended to appreciate the accommodation on offer. The accommodation comprises reception hallway, bay windowed sitting room with open views to the front, separate dining room and a kitchen whilst on the first floor there are 3 bedrooms (two of them having open views across Torquay with Dartmoor in the distance) and a modern fitted shower room. The property benefits from the installation of uPVC double glazing and gas central heating. Outside there is a small front garden, and a rear garden. Stairs rising to first floor, radiator, telephone point, under stairs storage cupboard, dado rail. uPVC double glazed bay window enjoying open outlook to the front over the surrounding area with Dartmoor in the far distance. Feature fireplace fitted with a gas fired on a raised marble effect hearth with wooden surround.. Radiator, television aerial point. Radiator. Corner cupboard unit with deep shelve. Radiator. uPVC double glazed window looking on the the rear patio and garden. Fitted with a range of base units with drawer and cupboard space set beneath roll edge work surface with tiled splash backs and inset single drainer stainless steel sink unit. Space for cooker. There is further work surface with space for under counter fridge and plumbing and electrics for washing machine. Wall mounted cupboards. Extractor fan. uPVC double glazed door and window to the rear garden. Access to roof space. Linen cupboard housing the gas fired combination boiler and slatted shelving. Dado rail. uPVC double glazed bay window to the front enjoying an open vista across Ellacombe, Torquay with Marldon and South Hams Countryside and Dartmoor in the far distance. Recess with built in wardrobe unit with hanging space and further storage over. Radiator. Located to the rear with uPVC double glazed window looking across the gardens and surrounding area. Radiator. Recess with built in wardrobe unit with hanging space and further storage cupboards over. Modern white suite comprising a a step in shower cubicle with electric shower and tiled splash backs, pedestal wash hand basin and low level WC. Recess with shelving. Obscure glazed window to the rear. Radiator. The garden to the front has a flower border but is mainly laid to lawn with steps leading to the front door. To the rear immediately outside of the kitchen door is a small courtyard area with a useful shed and `gardeners toilet` Steps rise to a paved patio area which then adjoins an area of garden previously used as a vegetable garden and slopes up to the rear access lane. The lane is accessed of Grange Road. At the top of the lane and adjoining the top of the garden is currently a garage space (which does require some works) this could be demolished just to leave as a hard standing or a new shed/workshop could be erected in its place.